When it comes to remodeling your kitchen, the sky is the limit. You can enlarge the space so that it’ll be easier than ever before to cook delicious meals with loved ones. 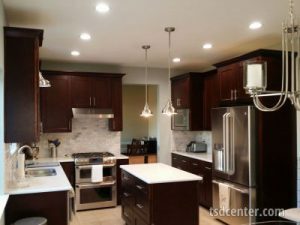 Additionally, you can have new flooring, cabinets, countertops, lighting, backsplash, and other features installed. Have you often wished you could come home after a long day of work and enjoy a relaxing bath in a luxurious soaking tub? Or, do you have a bulky tub that you’d like to replace with a modern walk-in shower? While renovating your bathroom, you can transform it into the functional space you have long wanted. If you and your family need more space to spread out in, investing in a room addition is a fantastic choice. By doing so, you can add an extra bedroom, master suite, family room, home office, or in-law suite to your home. Since 2007, the experts at Star Home Remodeling have been customizing clients’ homes to enhance beauty, functionality, and value. When you turn to us for your home remodel, you can rest easy knowing you’re working with highly skilled professionals who can complete every aspect of your remodel. From a full-scale kitchen makeover to building the home addition you’ve always wanted, we can take care of your project. And, we’ll do so while providing five-star customer service. To learn more about the home renovation we can complete at your Plano home, contact Star Home Remodeling today. We’ll be happy to answer any questions you have.